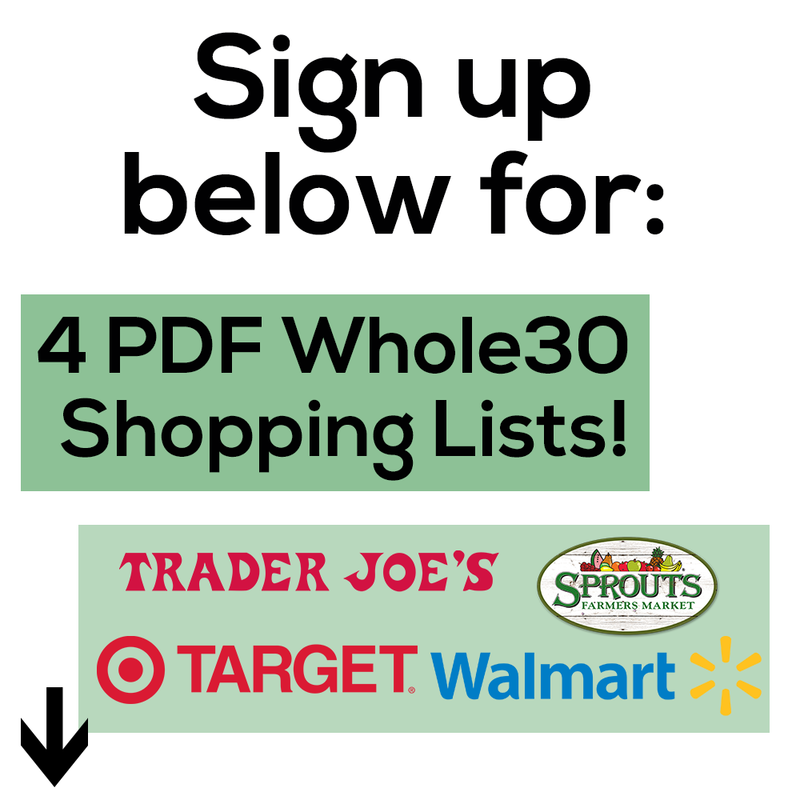 Where are my Instant Pot fans at?? Well even if you don’t have one this recipe is one I can already see myself making time and time again!! It can easily be made in the slow cooker too, but 15 minutes for tender and tasty chicken is a little life changing. 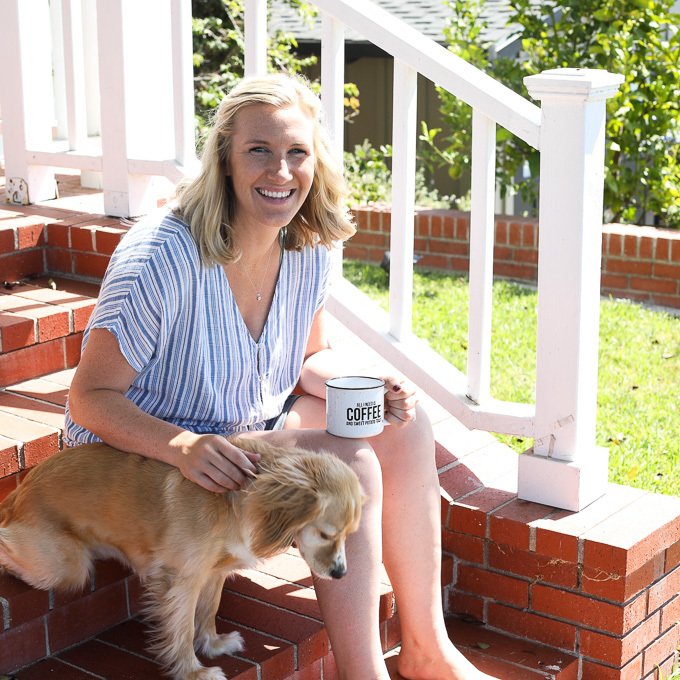 I got an Instant Pot – which is a pressure cooker – on Amazon Prime day and I am so glad I did!! I’ve made about 4 or 5 things in it so far and am so impressed with how fast it can cook stuff while making it tender and moist too! I love my Salsa Chicken and Greek Chicken recipes on this blog and am so happy I can now make them in 20 minutes vs. a few hours in the slow cooker. 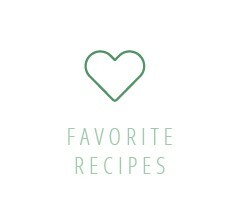 I plan on posting a lot more Instant Pot recipes on my blog but if you don’t have one and don’t want on, DON’T WORRY! I will have instructions on how to make it in slow cooker too. It will just mean a longer cooking time but the same delish flavor will be there! 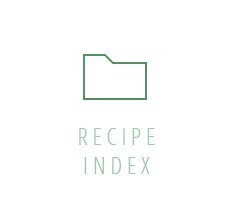 Now let’s jump into this recipe! Chicken Shawarma is one of those things I never remember I love until I randomly order it at a Mediterranean restaurant and freak out about how amazing it is! It packs so much flavor because it literally has tons of spices in it!! This also makes it so easy to make because all you have to do is blend the spices all together, mix them with the chicken, add some chicken broth and you’re done! I served mine on some sweet potato toasts with greens, grilled bell peppers and some tahini sauce! I had made the grilled bell peppers for my ebook the same day I made this chicken so it was perfect! I am getting SO excited for this ebook launch and to share all of the ways I make my veggies extra yummy! 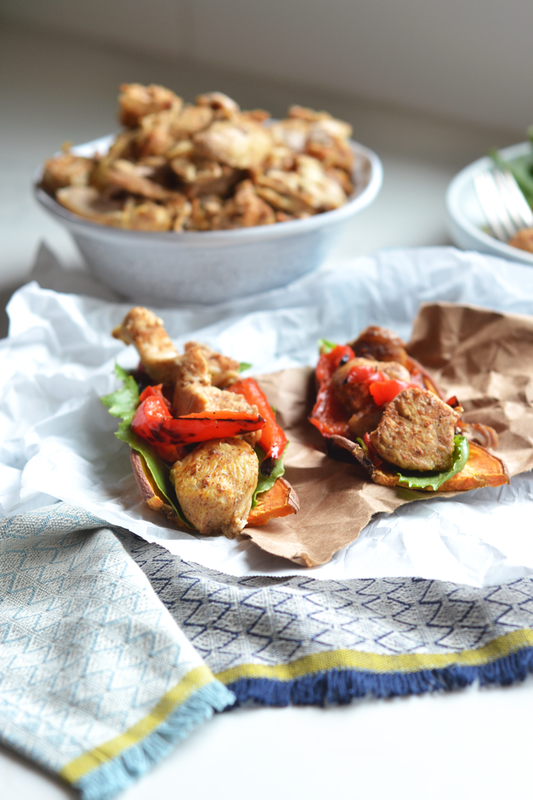 This dish definitely proves you don’t need hummus or pita to have a super delicious mediterranean meal that is also paleo! But if you aren’t limiting grains I bet this baby would also be fabulous in a pita of any kind! Okay now its time to get out your instant pot (or order one) or slow cooker and create some magic! 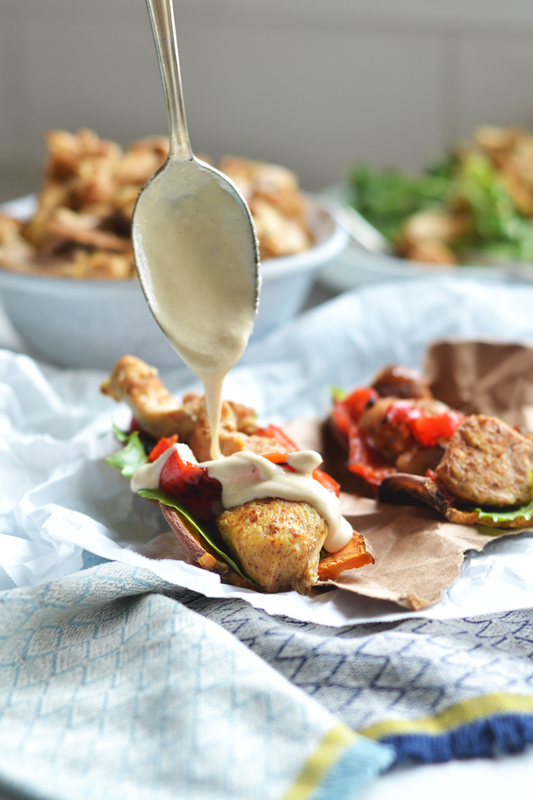 Drizzle on the tahini sauce… you can thank me later! Question – what is your favorite mediterranean dish?? 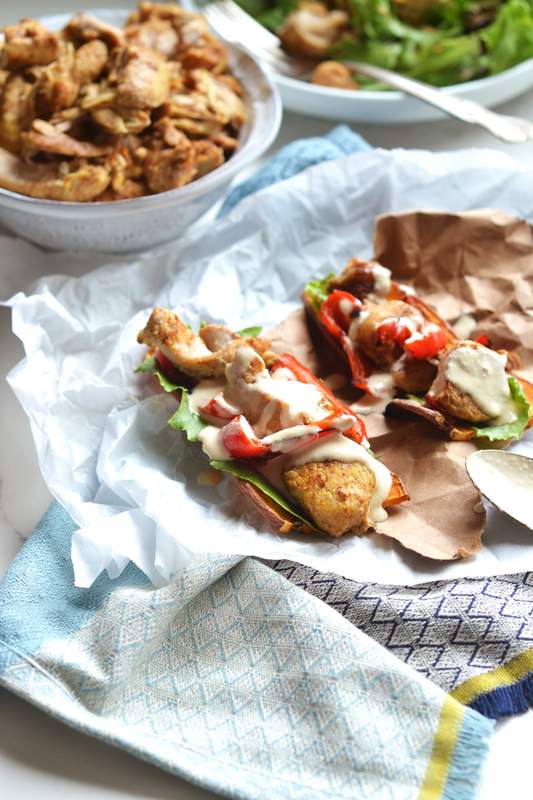 Pin this Instant Pot Chicken Shawarma to save for later! Slice chicken breasts and thighs into strips and place into your instant pot. In a small bowl combine all of spices (cumin – cinnamon). Pour the spice mix over the chicken with a pinch of salt and some pepper. Mix it all together so the spices evenly coat the chicken. Add chicken broth to the pot and secure the lid. Place it on the poultry setting and get the time to 15 minutes. Once the time is up let it depressurize on its own for 10 minutes then turn the steam release to venting until all the pressure is released. 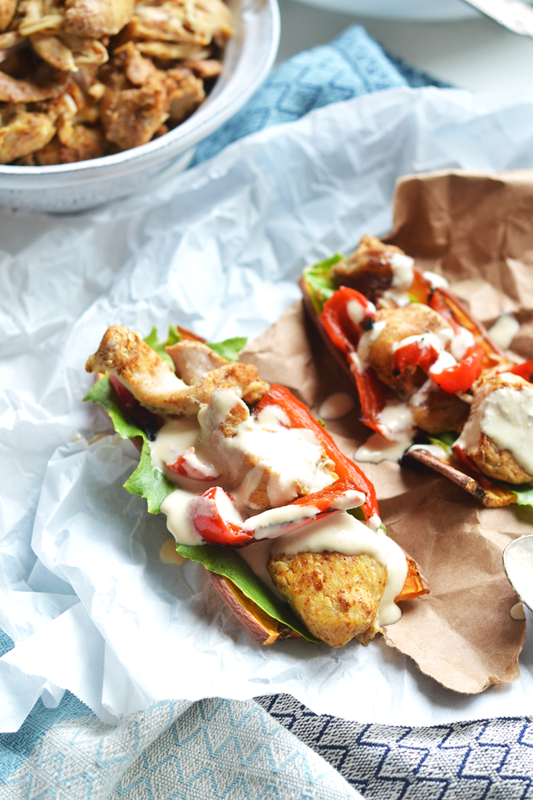 Serve with veggies or on sweet potato toast drizzled with tahini sauce. If making in a slow cooker, follow the same instructions and cook on low for 4 hours. Why did you go with breast/thigh combo? I think thighs add such a fabulous flavor!! Kelsey! I have so enjoyed following your blog. I plan on trying this recipe out soon! My husband and I LOVE Mediterranean food. I recently came across this recipe on Pinterest ( http://iowagirleats.com/2016/03/21/chicken-shawarma-fries-mediterranean-salsa-garlic-sauce/) and wanted to share it with you as it was one of the best meals I’ve ever made. Thanks to this lady who posted it! But, since you asked what my favorite dish is, this is one of them! Blessings, and thank you for sharing all your wonderful stories, recipes and being a joy! Kelsey! I’m loving all your instant pot recipes I just got mine and am literally scared everytime I use it! Great recipe! Hahaa omg I know it’s a little scary!! Thanks so much!! What is the tahini sauce that you use on top? Is it just tahini, or a sauce you make? I looked (not that hard) but couldn’t find a recipe? 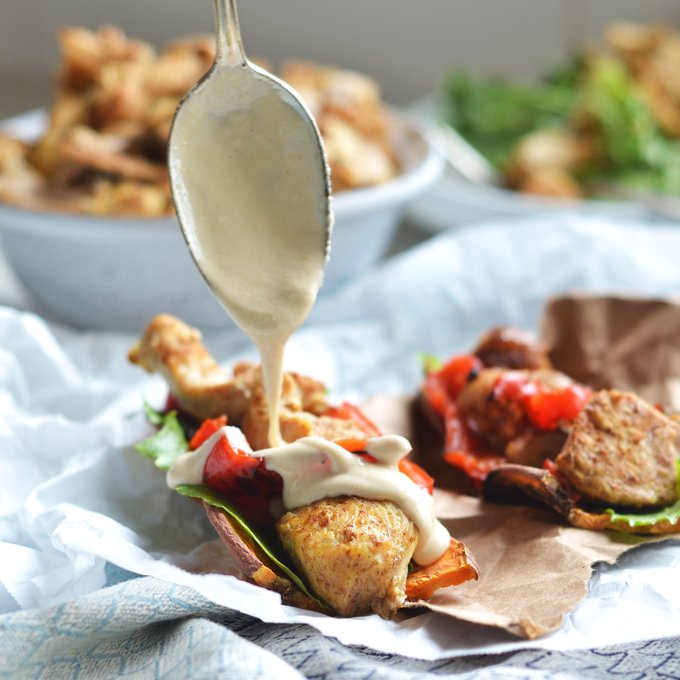 I linked to the tahini sauce in the post! It’s on my site already! Ohh I guess I should actually have read the post and not just skipped to the recipe! This was amazing and so simple!!! Just finished dinner. This came out super bland, and the breast it out chewy and dry. I followed the recipe exactly, except I used drumsticks instead of thighs. Super disappointed. Hmm It might have been the use of drumsticks! They are much different than thighs and I haven’t tested the recipe with them! I did also feel it was a bit bland. I am going to double the seasoning next time. I put the chicken in a pita with garlic sauce, cucumbers, tomatoes and some tzatziki and it helped give it a flavor boost. Turned out great. I used a little more thigh than breast as my friends have said they do better in the instant pot! It was so easy and delicious with steamed broccoli and tahini sauce! Made leftovers for the week. Thanks for a great recipe! Yay!! So glad you enjoyed it! Great and easy recipe! I do about 3 lbs of boneless skinless thighs and double the spice mixture. I serve it with feta, kalamata olives, and tzatziki sauce. I am excited to try your recipe. But am wondering why granulated garlic instead of fresh? Hoping to avoid adding another jar to my overflowing spice drawer! Thanks! You can use fresh! I just use garlic powder a lot because it is so much easier! If I cook this in a different make of electric pressure cooker, instead of a poultry setting, should I use low pressure? 15 minutes at high pressure for chicken cut up seems too much. Thanks. Ooo I am not sure about other pressure cookers! They are thighs so they can handle a little longer! Made these tonight and they were AMAZING!!! My hubby and kids had two servings each and said that I could add this recipe to our bi weekly rotation of dinners. This recipe took a boring night of chicken and made it fabulous. Thank you for the amazing recipe! Made this recipe last night on a whim to try something new. ABSOLUTELY LOVED IT!!!!! The whole family loved the chicken and asked for seconds and thirds. Thank you for a new recipe for our family. That is awesome to hear!! Loved it! Super easy. This will be a regular on the menu from now on. Making this for the second time tonight! First time my husband was out of town and my niece and I are most of it. She begged me to send the leftovers back to the dorm with her. Can’t wait for my husband to try it too!